➤Gear 0 is suitable for cutting wood and plywood. ➤Gear 1 is for small curve, suitable for cutting low carbon steel, aluminum and hard wood. ➤Gear 2 in the curve cutting processing for rapid cutting of aluminum and low carbon steel. ➤Gear 3 is for large curve cutting processing, suitable for fast cutting of wood and plywood. ➤6 different speed dial: 1-4 for cutting plastic, 2-3 for steel plate, 3-4 for stainless steel, 3-6 for aluminum, 5-6 for wood. ➤4 gears of laser guide and LED: separate laser and LED lights, opening amd closing of laser and LED lights at the same time. ➤It can do straight cutting, diagonal cutting and curve cutting, which meet different cutting needs. ➤It can cut on different materials like metal, wood plastic, gypsum board and so on. ➤Wear-resistant Aluminum base is stable and not easy to deformation. ➤Soft no-slip rubberized handle provides comfortable grip feeling and less fatigue. ➤9.8Ft(3M) power cord lets you work in a big enough space without limitation. 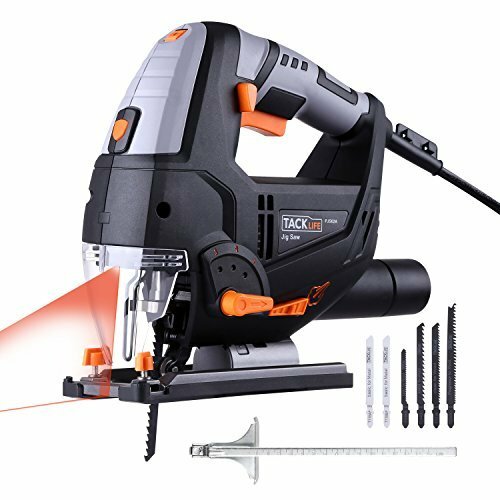 ➤Reasonable dustproof design and low vibration makes a clean and efficient work.